My correspondent this time is Nicola Burton of Oxford University Press, who's been looking after the publicity for my recently published Words in Time and Place, and who has come up with a novel way of presenting the word-clusters in the book. She's taken the word-cloud motif on the cover - all the words for nose formed into the shape of a nose (with more than a passing resemblance to my own hooter) - and extended it to the other thematic categories covered by the book. 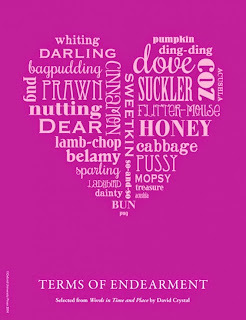 You can see them here, but this is an example, using the words covered in the category 'terms of endearment'. I've been wondering what to call them. They clearly fall into a tradition of visual poetry, sometimes called 'altar poems' (after the poem by George Herbert), and they are the hallmark of concrete poetry. But the practice of making words or sentences visually resemble entities in the real world goes well beyond poetry. Lewis Carroll's famous mouse-tail is an example. The term that is most obviously applicable is calligram - from calligraphy. I have examples in my Cambridge Encyclopedia of Language of some of Apollinaire's. 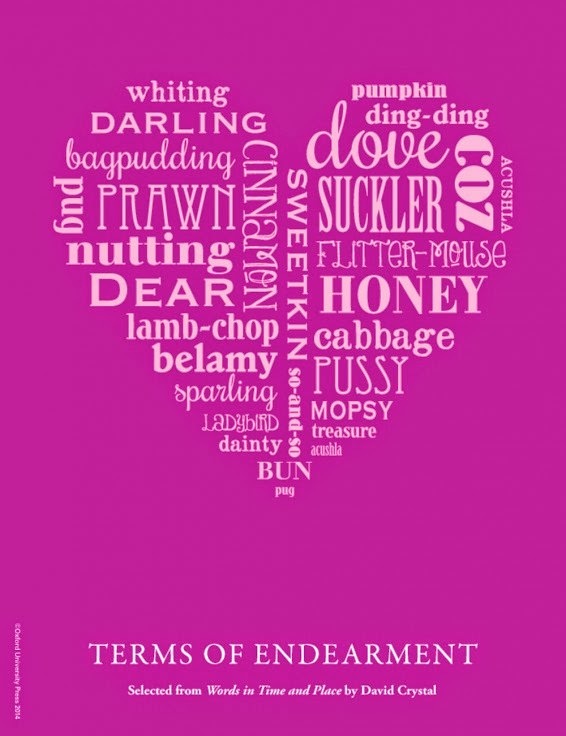 But word-cloud calligrams are so distinctive that I think they deserve a term of their own. Any suggestions? Since the OUP blog post went up (yesterday), the calligrams have entered social media, and have been significantly retweeted. I sense a new art-form here. My book was commissioned to provide a general introduction to the enormous Historical Thesaurus of the Oxford English Dictionary, and any semantic category of that work, large or small, could receive this treatment - and there are tens of thousands available. They can all be accessed through the OED online site, where there's a button allowing any word to be related to its location in the HTOED lists. Concrete words like nose or lavatory are likely to be relatively straightforward to handle (though they still need artistic ingenuity to be appealing). It'll be the abstract words that present the real challenge. But seeing as Nicola managed effectively to deal with death and endearment, I doubt whethere any word will be beyond the reach of the new generation of word-cloud calligrammers. A correspondent writes to ask about the use of it in relative clauses, in such sentences as the following (taken from Fowler and also a modern textbook). He finds its use unidiomatic in examples (3) and (5) in particular. Is the it omissible, he asks? (1) This was a conference which it was my duty to attend. (2) The debate on the bill produced a tangle of arguments which it required all Mr. Chamberlain's skill to untie. (3) This is a thing which it is easy to say. (4) The heaving and turbulent centuries which at one time it was the fashion to characterize the 'Dark Ages' have long had a peculiar fascination for historians. (5) That is a question which it is very hard to answer. These are quite complex syntactically, as they all have a nonfinite clause inside a cleft construction inside a relative clause. To see what's going on we need to simplify. Let's get rid of the clefting first. (1) My duty was to attend (the conference). (2) Mr Chamberlain's skill was required to untie (the tangle of arguments). The semantic links are clear: duty goes primarily with attend, not conference. Skill goes primarily with untie, not arguments. If the it were omitted in the original examples, the force of the relative pronoun would be to point the listener/reader semantically backwards, towards the head noun. Duty would now seem to go with conference, and skill with arguments. The it restores the right semantic connection. So, in short: we avoid a potential ambiguity - though the fact that there's so much usage variation (the it often being omitted) suggests that it isn't one that causes much communicative difficulty. The ambiguity is there in (3) and (5), but the shortness of the sentences, along with the clear meaning of the elements, makes the presence of it less needed - which is why my correspondent has noticed it when it's inserted. It is easy to say (this thing). It is hard to answer (the question). It's obvious that things don't do the speaking or that questions don't do the answering, so semantically there's no need to reinforce the point when the clefts are restored. This is a thing which is easy to say. Only someone ignoring the semantics would say there's a genuine ambiguity here. But traditional grammarians, obsessed with making a rule work in all cases, did regularly ignore semantics. And anyone following those rules will insist on inserting the it in these cases, probably on the grounds that it helps avoid a possible momentary distraction. From a psycholinguistic point of view, there may be a point here, but it's hardly one that's likely to cause communicative interference. I doubt whether most people would ever even notice that an it was omitted in (3) and (5). And some, such as my correspondent, evidently find the usage with it intrusive. (4) is a special case, as it's a badly constructed sentence, which could do with being rephrased anyway! Try reducing the sentence to its basic form and you'll see what I mean.